Security is a complicated process that involves technology, people and organizational structures in particular, and that can only be achieved by implanting a good safety culture within the organization and developing employees’ risk awareness. Employment injuries and occupational diseases can and must be prevented. VISION ZERO helps to achieve this goal and ultimately “zero accidents”. A case study below shows that it is possible to combine high safety standards and zero accidents with high labor productivity. This requires a large package of measures such as clear organizational structures and responsibilities, training at all levels, sharing experiences with colleagues and other societies to learn from each other. It is imperative to convince employees that safe work is an extremely important benefit for everyone, their families, and the image and quality of the products they make. VISION ZERO – is it a realistic target? Due to relating experiences the answer is „YES“. But before going into further details there are some general hints. VISION ZERO is not only a target but it is also part of the prevention strategy in a national OSH program and in an individual industry program. You have to realize that accidents at work and occupational diseases do not occur by twists of fate or only because of mistakes of the employees. It is the general obligation of the management to prevent them. The management has to care for all necessary items to prevent them and has to care for all necessary items for VISION ZERO to become true. Before undertaking any measures, become aware of the starting position and make a realistic inventory of the situation. Subsequently some examples of an inventory. Figure 1 shows a very poor blasting result with many huge blocks causing problems during loading, hauling and in the primary crusher. There is no save access to the cabin of the excavator. There are two fields with urgent need of action: The drilling and blasting activities as well as the safety equipment of the engines. 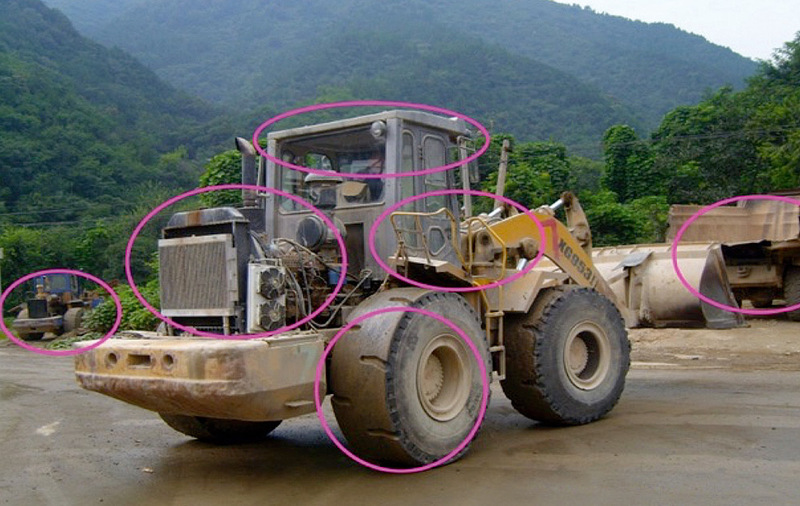 Figure 2 shows a wheel loader without Roll Over Protecting Structures (ROPS) and Falling-Object Protecting Structures (FOPS), without windscreen protection and unable to handle these huge blocks. 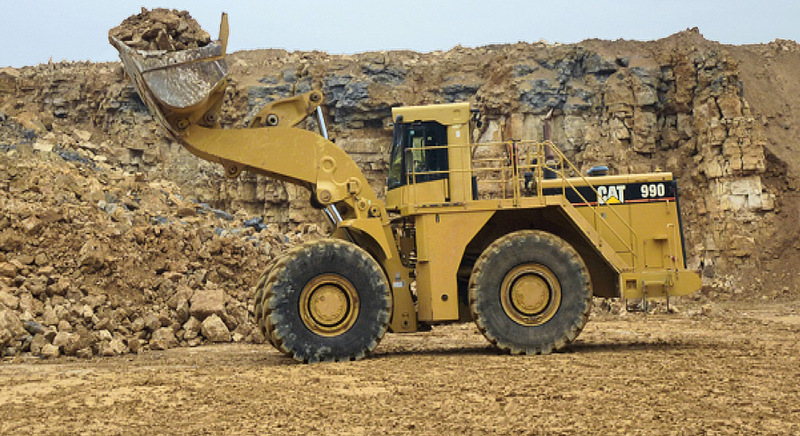 During loading these blocks the rear axle of the wheel loader will lose the contact to the ground as well as the wheel loader will lose its stability and the next injury is predictable. The figures 3 and 4 do not need any further comment. You can see very big problems in many areas of operation – from the quarry to the workshop to the power supply. No one should wonder about further fatalities and unreliable operation-conditions. 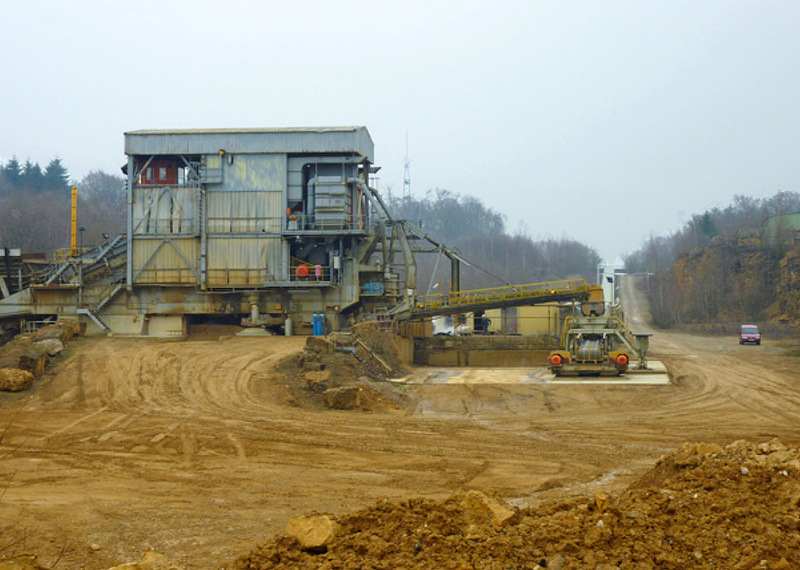 A European cement plant is operating the quarry in our case study about 1 km from the clinker fabrication. Because of this stand-alone situation and in conjunction with the target VISION ZERO there have been done risk assessments very intensively as a basis for safe quarry operations and in order to reach the target zero accidents. The risk analyses have not only been done for the conventional operations but also for repair- and demolition works within the following scopes of work: mine planning, loading and hauling, crushing, repair shop and risks by electricity, dust, work in height and other dangerous work. The geological situation is rather simple. The mined mineral is a Jurassic limestone within the so called Paris Basin, an undisturbed sediment deposit needing no special attention because of the dip and the strike during mine planning. This allows to concentrate on the height of the faces, which vary between 10 and 12 m. This is – in relation to the size of the wheel loader – a comfortable height. The wheel loader is able to clean the face from rockslides up to a height of about 7 m.
The operator works in a stand-alone workplace. To stay in contact with the foreman and/or other colleagues, he is supplied with a walkie-talkie at his personal disposition. One colleague is obliged to contact the drilling-operator several times per shift. To prevent traffic-accidents, the working-area of the drilling-rig is separated by large stone-blocks. To reduce the risk of traffic-accidents beyond the working-area revolving signal lights are mounted on the rigs. For avoiding accidents because of rockslides the rigs are equipped with FOPS cabins. Only authorized members of the staff are allowed to handle explosives and detonators according to the governmental requirements and the operating procedures. In order to assure a maximum safety level concerning rock fly and a minimum of vibrations the operator uses an ignition system of non-electric delay detonators. 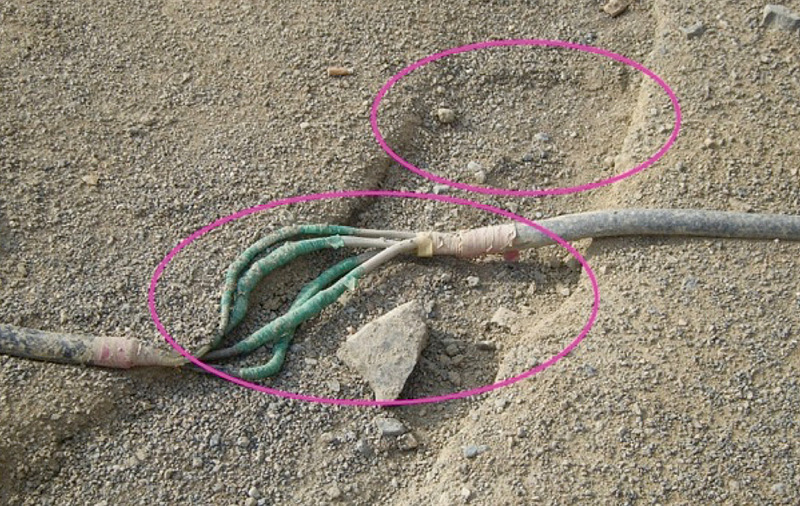 They consist of a length of shock tube with a surface detonator attached to one end and an in-hole-high-strength detonator on the other, which can be easily connected to one another. 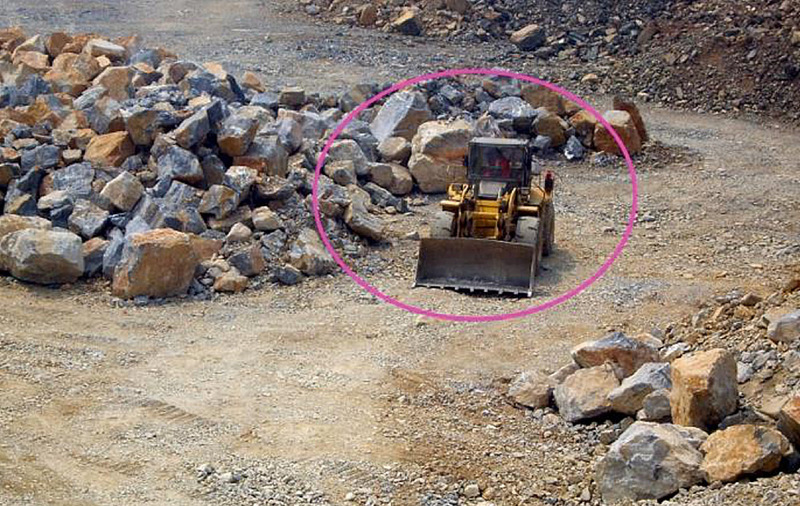 Concerning the risk assessment for the operation especially of the wheel loader (Figure 6) there are two major items to be pointed out. The first one concerns rockslides from the face. 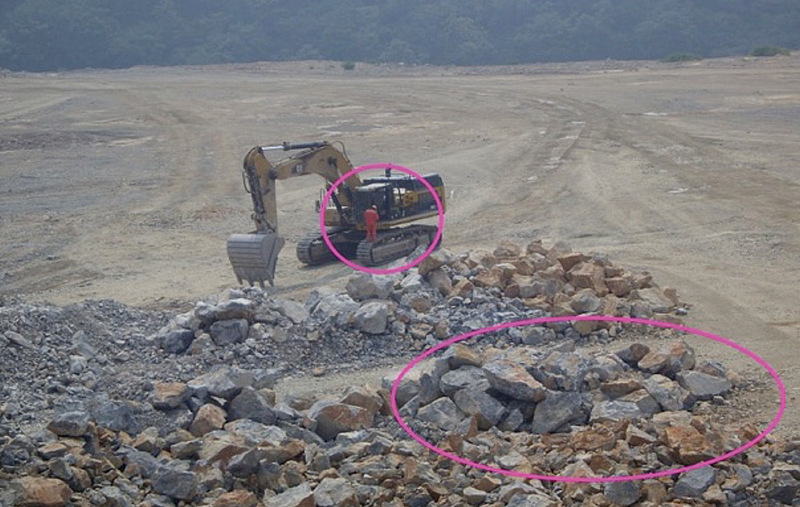 After blasting and before beginning to load, a check of the rock pile has to take place. If there is a risk which cannot be solved with the wheel loader, the head of the staff has to be informed in order to organize the clearance of the face. The other major risk is the operation of the wheel loader too close to an underneath situated face. This risk is avoided by operating the engines no closer than 5 m from an underneath face and by directing the exploitation in order to assure a sufficient bottom width. The risk-assessments have pointed out, that the individual traffic in the quarry leads to an important risk of accidents. Fig. 7. 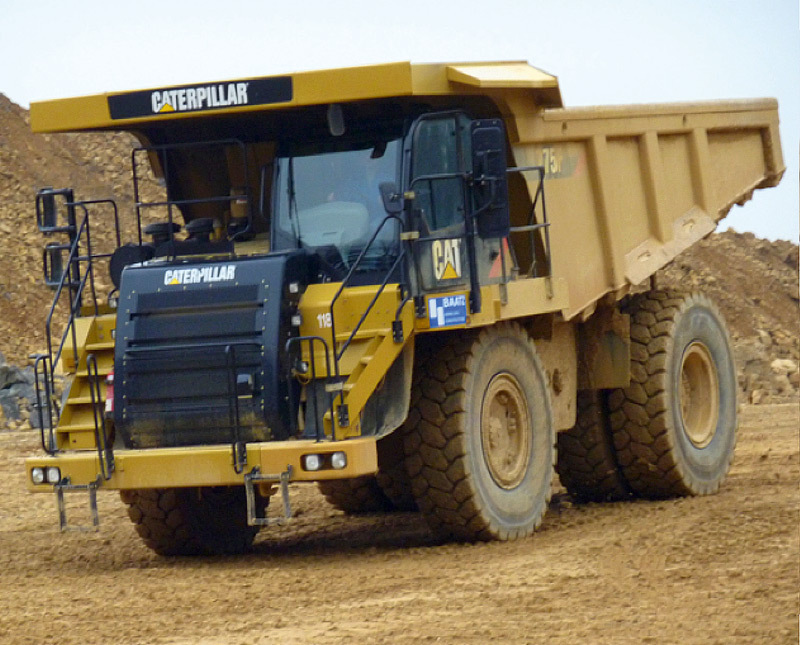 Hauling is done by means of two CAT 775-dump trucks, payload 64 t, 750 hp. // Bild 7. Die Förderung erfolgt mit zwei CAT 775-SLKW mit einer Nutzlast von 64 t und 750 PS Antriebsleistung. Due to the risk of collision between the transport- and/or loading engines (Figure 7), the drivers have to pass an examination every year after having passed a medical check-up. To reduce the risks during loading or transportation, the machines are equipped with safety-features as safety-belts, backup warning systems, ROPS-cabins, improved steps, etc. To avoid risks due to black ice, fog, rain or poor visibility, the roads have reflecting markings. For avoiding dust emissions, the roads are moisturized regularly. In case of frost, salt is dispersed on the roads. The hauling roads are marked by large stone-blocks. 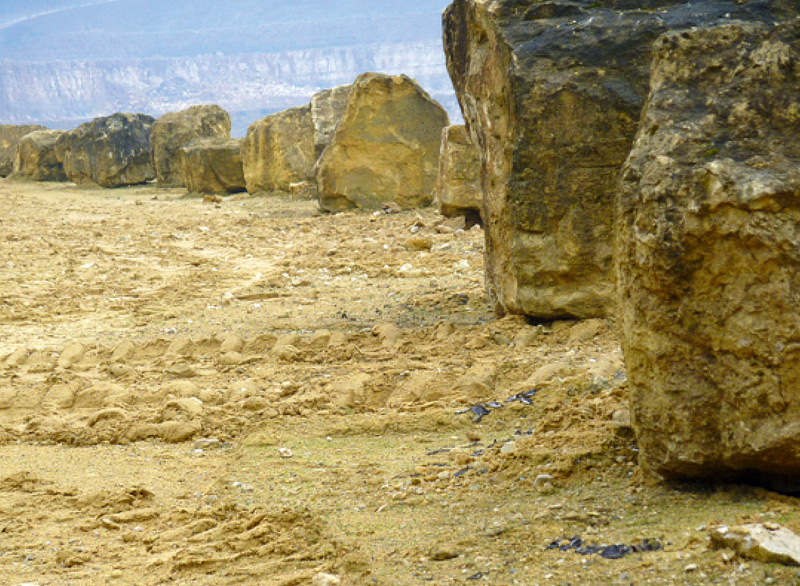 Due to the risk of stone fall it is forbidden to approach the face closer than 5 m. The hauling roads are marked and secured by large stone-blocks (Figure 8). To reduce or minimize this risk, the curves of the roads in the quarry are marked by fluorescent road signs (Figure 9). Regular maintenance of the hauling roads is as important as salting in the curves during frosty periods. The risk assessments concerning the primary crushing have been done with the following results. First of all there is the risk of falling or slipping into the pre-hopper situated ahead of the feeder of the hammer-crusher (Figure 10). This has been taken into account in the operating instructions forbidding the access to this area during the operation of the hammer- crusher. The necessary check of the situation can be realized from a platform over the pre-hopper. The traffic zone of the dump trucks is another risk around the primary crusher. This zone is marked and separated with a chain, respectively with a safety sign. To protect the operator against the risk of rock fly out of the roller crusher, it is compulsory to operate the crusher in the cabin, which is also soundproofed, shock absorbed and air-conditioned. First of all each member of the staff has to respect all general rules and directions of the plant and especially of the quarry. New members of the staff and external contractors have to pass – before they begin to work – a comprehensive health and safety briefing and to confirm the participation. Moreover to each member of the staff including the external contractors a brochure dealing with an overview of all the safety prescriptions, internal behaviour rules and important telephone numbers is handed out. 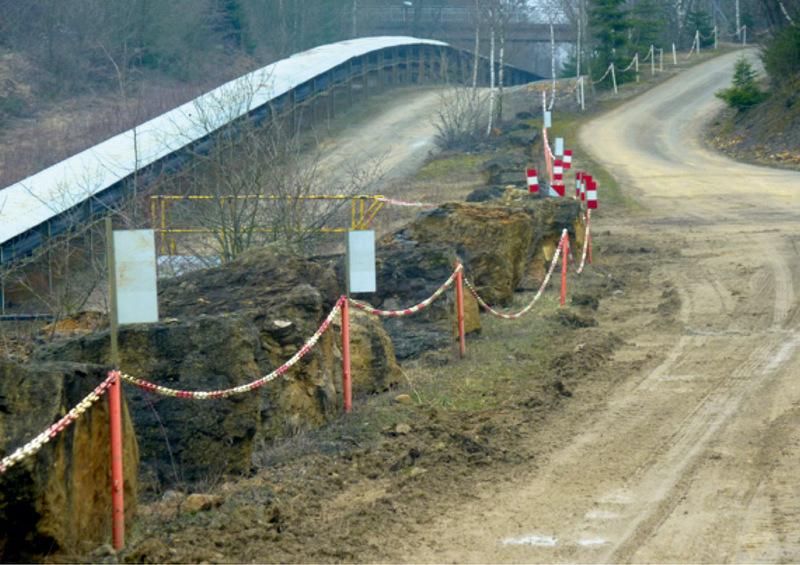 In order to avoid the risk of pneumoconiosis roads and the working areas as well as the transfer chutes and the pre hopper area are – as already mentioned – sprayed with water whenever necessary. Moreover all cabins of the engines, the drilling rigs and the crusher are air conditioned. The primary crusher and the drilling rigs come with sufficiently dimensioned bag house filters. Everyone who works under certain dust influence, e. g., in cases of maintenance, must wear his personal dust protection filter and he will be annually checked up by an occupational physician. All work in height will be performed on work platforms equipped with guard rails or – if not possible – in boom lifts or by using special personal protection equipment. Dangerous work is allowed only after having achieved a special written permit from the head safety engineer. This permit informs about all risks of the dangerous work and all the safety precautions having to be taken. It is self-evident that intensively and carefully performed risk assessments cannot be the only measures leading to VISION ZERO. Therefore, it is very important according to the 7 Golden Rules of VISION ZERO to take care of one´s employees, to invest in the workforce and to train and motivate the employees.What does this mean in our case study? The head of the staff has passed an external qualification of six months dealing with all questions around the quarry such as safety aspects while drilling and blasting, rock-mechanics, operation of wheel-loaders and dump-trucks. The miners have passed a governmental qualification for handling of detonators and explosives. This qualification has to be renewed every year. Every operator of a wheel-loader or a dump-truck as well as the staff of the repair-shop have passed a special qualification in a training center of the engines manufacturer. These training-courses also have to be repeated every year. It works for more than 20 years without accident. In this case accident means the consultation of a physician after injury during work, not 200 days off or more. It works with higher productivity than other quarries because of better knowledge of the work to be done – also in the management – after the risk assessments and better motivation. It works with higher availability of the equipment at lower operating-costs. In the reference quarry the actual rates of lost work time are at about 50 % of the average of the European cement industry. In critical situations – on the occasion of a fire or an accident – you will get very fast an impression of the quality of the organisation, good or not so good. Very often a poor or missing safety culture is the reason for not reaching the targets of VISION ZERO. Safety is usually defined as a state in which the remaining risk is classified as acceptable, e. g., on the basis of the number of accidents. But this definition refers only to the history and implies a more or less personal opinion. It strongly seems to be better to understand safety as a process with human beings, technology and organizational structures to be optimized. This process should be part of the company´s safety culture. The safety culture and the safety climate are very important factors incorporating usefulness and codes. The situational awareness is essential for the perception, the understanding and the anticipation of a situation. Why do mistakes accidents occur? Fatal accidents are not caused by one mistake of one person but they are a part of a series of failures. These mistakes are part of an individual situation within a workforce. This extremely difficult problem can be solved by investing in the workforce, by generating pride in their work and motivation. VISION ZERO is therefore not only a question of laws and regulations, but it has a lot to do with people and their interaction with technology. VISION ZERO is a dynamic process that has to be constantly adapted to the current development. He requires that you take his staff with you. If convinced, VISION ZERO becomes a sustainable reality. Many people argue that a contradiction exists between the goals of OSH and the goals of production. If the approach to VISION ZERO is only superficial, they may be right in a certain way. But if the approach is fundamental and honest, you will realize not only a moral obligation and fulfill laws and safety obligations, but you reach a better efficiency, higher production at lower costs and better quality by better preparation of production procedures you need for good risk assessments. You will increase the efficiency and realize a higher production rate and quality at lower production costs by better preparation of the production procedures which you need for good risk assessment in any case. Beside all ambitious goals, laws and regulations we have to keep in mind that the most important prerequisite to reach the targets of VISION ZERO in daily routines are the safety culture within an organization and the risk awareness in the workers mind. For the target of VISION ZERO it is a must to care for healthy working conditions. PPE, light, climatisation, tools, seats, screens, regular service of occupational physician must be kept in mind. that safe work has an important and positive influence on the products quality and the productivity. Good and realistic risk assessments have to be done not only for regular operating conditions but also for all repair and demolition works, where many accidents happen. Besides all rules and reglementations you must not forget: Finally no additional laws and inspectors will help to realize VISION ZERO in daily routines, because the most important essential elements of VISION ZERO are the safety culture and the risk awareness in the minds of the staff. These two extremly ambitious goals have to be reached.